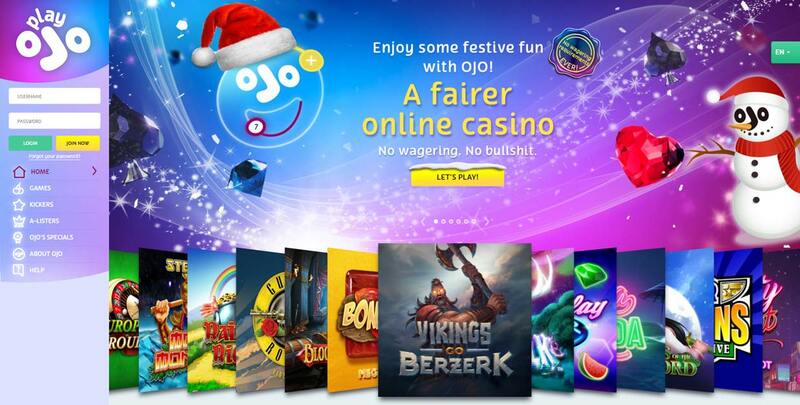 Play OJO is a new online casino launched this year. What you see is what you get at PlayOJO. This unique no-nonsense Canadian casino brings plenty of thrills to players and is also dedicated to fair play of the highest degree. PlayOJO ensures that their “OJOers” have fun while always remaining in control of their money and their play. This is achieved with the help of player-friendly and player-first features like OJOplus, which gives you money back on every bet (win or lose), no wagering requirements, and a Play Manifesto. Enjoy a myriad of incredible slots, jackpots and a live casino in a safe and rewarding environment. The casino’s OJO character is your sidekick and if you stick with him, you’re guaranteed a good time. PlayOJO Casino launched in 2017 and is licensed by the Malta Gaming Authority and the UK Gambling Commission. There are no wagering requirements at PlayOJO Casino on any of its bonuses or rewards. Any winnings a player may receive from the games they play is theirs to withdraw immediately, whenever they choose. Restricted countries include: Hungary, Romania, the Republic of Cyprus, Italy, Israel, Turkey, the German State of Schleswig-Holstein, France, Mexico, Spain, Denmark, Belgium and the USA. There is no traditional match deposit welcome bonus at PlayOJO. Instead, new players can benefit from OJO’s Welcome Play Package. The way it works is simple, for every C$1 you deposit you get 1 Free Spin up to 50 Free Spins. As was previously stated, there are no wagering requirements or hidden terms on any winnings you might get form your free spins. All winnings are paid in cash (OJO’s Reward and Game Play Policy Applies). There is more than one way to claim free spins at PlayOJO. In addition to the welcome offer, you may be able to claim this reward in your Kickers if it happens to be one of the offers available to you. Kickers are daily offers that are new and different daily. Each day, you can claim one of the offers that is waiting for you. Another thrilling way to get free spins is to win them by taking part in OJO’s Reel Spinoffs. Thousands of Free Spins are up for grabs and to get your chance to win them, you can take part in live tournaments daily. Other great ways to get free spins are by being an active member of Club OJO, PlayOJO’s multi-level VIP Program, or by spinning The OJO Wheel, which rewards loyalty. Powered by popular SkillOnNet, PlayOJO Casino is available across multiple platforms, including both desktop (no-download/instant play) and mobile (HTML5). Regardless of the option you choose, both offer you an efficient, reliable and high-tech iGaming experience. The casino’s fast and smooth performance enables you to enjoy outstanding entertainment in a fully SSL (secure socket layer) secured environment that is easy to navigate and is about as user-friendly as they come. As for great gaming on-the-go, you can enjoy a wide range of games via you iOS or Android smartphone or tablet when you download the PlayOJO mobile app. There are over 500 games at PlayOJO that extend from the best slots and top progressive jackpots to virtual table games and a live casino. No matter the fun you crave or your skill level, you’ll find something to fulfill your desire for thrills at PlayOJO. Take your pick of the most popular titles and latest releases from many fantastic game providers including NetEnt, Microgaming, WMS, Amaya, Yggdrasil, Play’n Go, NextGen Gaming, Merkur and more. There are also special in-house slots under the GVG brand. As for the live casino, it’s powered by XPG, Evolution, Extreme Live Gaming and NetEnt. If you should find you ever need help during your PlayOJO experience, the OJO team is ready to help you any time of the day or night, all year long (24/7/365). You can get in touch with the multilingual friendly, professional and knowledgeable team via your choice of live chat, telephone or email. You can also refer to an FAQ section if all you’re looking for is a simple answer to a common question. PlayOJO’s unique player experience makes it an incredible place to play. The award-winning Canadian casino, includes over 500 games, no wagering requirements, 24/7 multilingual support, and encrypted SSL security technology. This, combined with its transparency, commitment to responsible gaming, and its super rewarding features including the OJOplus money back on every bet, daily Kickers, daily tournaments, the OJO Wheel and Club OJO, puts PlayOJO in a league of its own. Probably the best online casino for Canada to play with C$!